Reggie is out of town today and probably won’t read this post until Thursday, so instead of writing about gardening like I usually do on Wednesdays, I’m going to take advantage of his absence and indulge my readers in a silly and slightly sassy post about a cookbook I bought this weekend. I love cookbooks, especially the old ones. When I want to take a sentimental journey into the past, I curl up with my Culinary Arts Institute Encyclopedic Cookbook, copyright 1950. I can spend hours studying chapters like “Your Sandwiches” and “Your Snacks and Appetizers.” One of these days, I’m going to make a “Frosted Loaf Sandwich” and I’ll surely blog about it. Any time I stuff and cook a turkey or a broiler, I pull out The Good Housekeeping Cookbook, copyright 1963, and follow the directions and the time chart closely. It never fails. Boeuf à la Bourgignonne for Saturday night? Sure, I have a couple of Julia Child’s cookbooks. When I’m feeling earthy, I might put together a vegetarian quiche from either The Moosewood Lodge Cookbook or The Enchanted Broccoli Forest Cookbook. If I’m going somewhere and I need to bring a dish delish, the Silver Palate Cookbook’s offerings are tried and true. I must admit, however, that I have no Junior League cookbooks. It’s not that I’ve never bought a Junior League cookbook; in 2007 when I was an active member of the Junior League of Boston, I bought 20 copies of the then newly-released Boston Uncommon. I had fundraising goals and they made great gifts and…coffee table books. I never kept one for myself. Well…with all these suppressed emotions surfacing, I quickly snapped up a 1976 first edition Dallas Junior League Cookbook at an antique show on Sunday. The dealer, anxious to make a sale, dropped the price by five dollars with a smile and pocketed my Andrew Jackson. 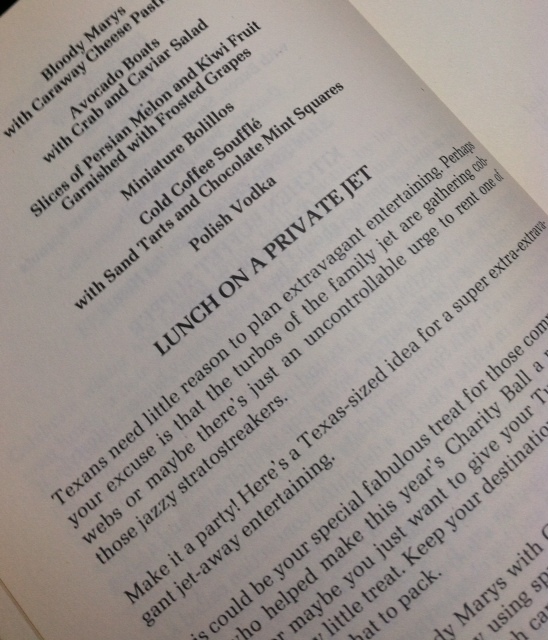 My plan: send the cookbook to a Junior League of Boston acquaintance transferred here from the Junior League of Dallas. Private jet noise…the sound of freedom and sophistication. Caraway Cheese Pastries sounded good, so I looked up the recipe and spied a delightful diversity of ideas. There were whole menu plans for “Russian Easter Dinner,” “Cinco de Mayo,” and “Oktoberfest” without the sauerkraut, although Mrs. Leo F. Corrigan, Jr.’s recipe for this fermented condiment was found on page 315. If the Dallas Junior League cookbook is a historical snapshot of a certain time and place, it looks like well-heeled women from that corner of the Lone Star State liked to start their meals with soups from all over North America; bring on the Cuban Black Bean Soup or even some Canadian Cheese Soup. After clearing and crumbing, Big D diners could dig in to hearty main dishes like Indian Chicken, Persian Chicken, and Greek Pot Roast; jet-setting globetrotters would enjoy endings like English Clove Cake, French Coffee Cake, Italian Cream Cake, Scotch Scones, Irish Oatmeal Cookies, and even…Beacon Hill Cookies. It’s a small world after all, isn’t it? I’m not ready to part with this cookbook just yet. I guess I have some more “work” to do within myself. For readers interested in more cooking ideas from the Junior League, visit this fun and sadly abandoned blog. Somewhere in the stratosphere, Reggie Black is cramped into a business class seat. He’s likely crunching on one of three pretzel twists graciously offered him by an overworked flight attendant and anxiously looking forward to reading any blog posts he’s missed. His Oysters Rockefeller Casserole will have to wait until he makes his touch-down. This entry was posted in Cooking and Food and tagged Junior League cookbooks, lunch on a private jet, The Junior League of Boston, The Junior League of Dallas. Bookmark the permalink. How come Reggie doesn’t have his own family jet, with turbos gathering cobwebs? Pity that he had to make the frogmarch through that godawful airport in Orlando (I’m guessing), my least favorite place to ever have to catch a flight from (and the best reason to own your own family jet). Btw, no true (read, German) Oktoberfest is complete without ‘kraut. Cookbooks, great topic! Keeping a family’s traditional recipes and the stories that go behind them can be a challenge especially when many of our mothers and fathers, grandparents and so on didn’t necessarily use measurements…they just knew it. Now with the web and digital cameras, computers and what-not, it is so much easier to gather the necessary Intel and even YouTube it for future users; however nothing will ever replace the time spent side-by-side with that person whom you love, baking cookies, making soup or salads, cleaning picked blueberries, and making pies. The saying “you don’t know what you’ve got til it’s gone” can be said for a lot of us…who thought household chores were boring, tedious and meaningless. Clueless, thankless and ungrateful we were, really. Sad lot. Though it may take eons for some of us to come around, life is so much richer when we finally do. For those like myself who are at last coming round, may I suggest the cookbook “More Spies, Black Ties, and Mango Pies…Second Helpings of Stories and Recipes from CIA Families all over the World”. A friend sent me a copy when I confessed “my Thanksgiving turkey didn’t thaw out until two days after Thanksgiving”. I laughed, I cried when I read “More Spies, Black Ties, and Mango Pies”, I found courage to do more experimentation in the kitchen and more of what I cooked didn’t need to get thrown out to the crow pile in the back yard. It’s the kind of book that ought to part of the High School Economics program (must read) all across the USA. It integrates history, world events, social studies, geography and basic survival skills 101. It’s also a tribute to people who quietly serve all across the world. To those who are serving or have served and their families, Thank you so much.